Flash back for a minute or two to college… and then to the pre-clinical years of medical school. You went to classes, read textbooks, reviewed slide presentations, studied for tests…. For any of you who made it this far there was one other, critical skill you used on a daily basis to make sure you really learned what you needed to know. You took notes. So why is it such a rare sight to see students and residents in clinical settings taking notes? Take notes? Why??? It’s all on the internet anyway…. Taking notes is not about storing information, it’s about learning information. I recently read The Art of Changing the Brain: Enriching the Practice of Teaching by Exploring the Biology of Learning by James E. Zull, a great book that that changed the way I think about how we learn (and why notes are important). Learning is a physical process. You physically create new synapses to make connections in your brain when you learn something. Just reading (or listening to a lecture) is only the first step in the process and won’t lead to real learning. So, how do you learn the information you need to be a surgeon (if you are surgery resident) or a pediatrician (if you are a pediatric resident)? How do you learn the fundamentals of all the different specialties (if you are a medical student?) You not only take care of patients and learn in the operating room or clinic … you study. And you make notes. REFLECTION. Just making categories and listing information in notes is reflective. (this is why it works, in a nutshell). You can expand on this (and make it even more effective) by intentionally being more reflective. i.e. I wonder if it’s true for all patients or if this is an exception? Is this the only way this illness presents? etc. etc. This can also lead to pulling up more information on PubMed, UpToDate or other sources. CREATING. The act of writing = creation. The more creative you are with your notes, the more this works. Create outlines, graphs or other visual aids to help you remember. Use colors, arrows, diagrams, mindmaps. Use different color paper, photos. Create your own mnemonics (the dirtier or weirder the better). TESTING. You’ll end up with a series of notes on different clinical issues (from patients you’ve seen, lectures, reading, etc). The last part of this cycle is to apply what you’ve learned to a new situation. When you see a new patient with pneumonia, for example, you pull out your notes on pneumonia and see if what you wrote applies to this patient. Get in this habit for two reasons. First, it completes the cycle of learning (the “testing” portion) and secondly, repetition is the key to learning. 1. Electronic or hand written? We are on the verge of having electronic tools which will make on the spot notes possible. The iPad (with Note Taker HD) is as close as I’ve seen. For some people (but not all) typing or writing on an electronic device will be as effective as writing by hand. For most people, the actual act of writing is key to learning. If digital note taking is effective for you , you might consider sites for on line storage of your notes such as Evernote or Zotero. Remember HIPAA, though – no patient identifiers!! 2. How I did it. In the middle of my third year of my residency, I realized I wasn’t effectively organizing what I had to learn. There was a superstar in our group (99th%ile on the inservice and always knew the answer on rounds)… so I asked him what he did. He carried blank 3×5 cards in his pocket and made notes on every chapter he read, lecture he heard, patient he cared for, operation he did… you get the idea. That’s where the 3×5 card method I’ve described in other posts came from. At the end of my chief year, I had 2 long boxes full of 3×5 cards. Those cards were all I studied for my boards. 3. Build in a system for repetition. Go through your notes in cycles. From the chart above you can see that it’s really at the 4th and 5th repetition that you learn. You might want a way to display the notes you want to keep reviewing to remind you to look at them. You might consider using an electronic flash card system like Anki which changes the repetition based on whether you’ve really learned it or not. Use a small notebook for each rotation, but figure out a way to tear out pages to file them. It doesn’t matter how you do it, as long as you come up with a system that you can organize and review every time the topic comes up again. So much of this is about your mindset. We don’t learn medicine for a test, we learn it because we are given the privilege of caring for other people. It’s really hard to think about “adding on” hours to study when you are working 80 hours a week. It’s not so hard to incorporate that study time into your work day by making notes in the 10 minutes you have between cases, or the 5 minutes you have at the end of clinic. Learning medicine doesn’t stop when you finish your training, so it’s important to develop a style of learning during your training that will serve you well when you start to practice. One other thing – if you make notes and study what you are seeing every day you will enjoy your work more – if you don’t believe me, just try it. This entry was posted in Education and tagged Clinical Rotations, resident, studying by marylbrandt. Bookmark the permalink. wow, this technique sounds amazing. i can’t wait to try this out. every day i learn something(s) new in clinic and i am sure i forget a good bit of it. going to go see if i can find some note cards hiding in my desk! I love the notes idea and one idea per page. I find index cards are great for this. Great post. Yes, repetition is key. Note taking is important, but using them is even more important. Anyway, I’m totally down with the flash cards, but I want to take it a step further. 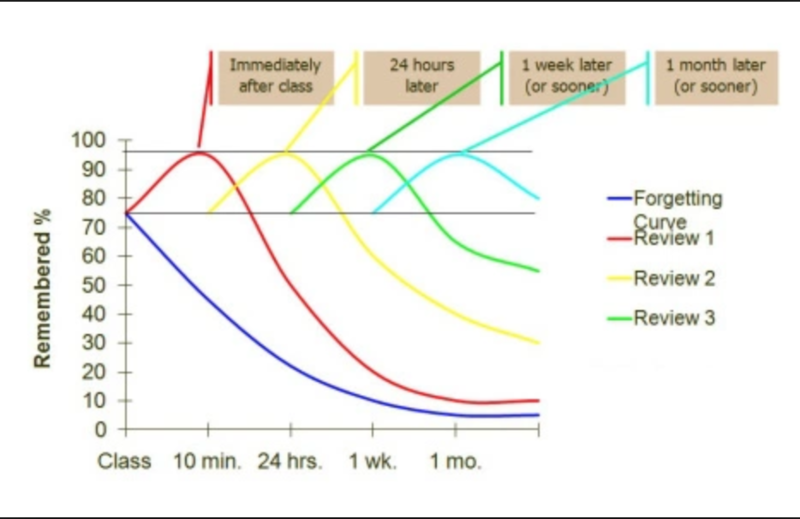 You reference Ebbenhaus and the forgetting curve, so I imagine you must know about spaced repetition flash card programs like Anki and Mnemosyne. I use Anki religiously for preclinical work and it’s amazing. I see things continually, in a maximally efficient way. I’m strengthening those synapses through constant review spaced for the right time. I’m so pumped to take this empowering method to the wards next year, and your post encouraged me so much. I was concerned that trying to get everything I read and experience on cards would an arduous and near impossible endeavor due to time constraints; but if it can work for paper cards, it can work for Anki. I’m going to get an iPad and hopefully that will make this strategy feasible. See a patient – make a card. Learn a new factoid – make a card. I wasn’t familiar with Anki – but it looks great. Thanks for the tip (and a new post topic)!